People wait in line to get tacos from El Norteno on Sept. 22 on Jesse Rogers Memorial Promenade. Photo by Gabriella Solis. 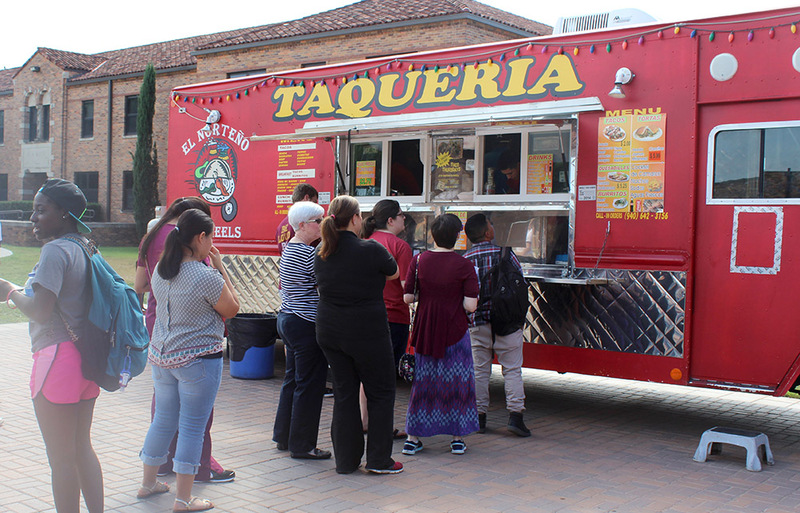 To give students an opportunity to try out local food in the Wichita Falls area, an estimated seven food vendors will be participating in a come and go Food Truck Friday event on the Jesse Rogers Promenade from 7 to 9 p.m. Among those who have agreed to participate so far are: Everybody Loves Funnel Cakes, El Norteño, Bahama Bucks, Stone Oven, Best Bayou, Mckinney BBQ and Red River Hot Dogs. The first 100 students will get a ticket that can be used to get an item from the food trucks. 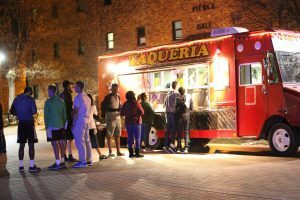 The item and participation are dependent on the food trucks themselves, Ruby Arriaga, the coordinator of Student Activities in the Office of Student Involvement, said. Red River Hot Dog said that they plan to participate with the ticket system offering one of their Red River Hot Dogs in exchange for tickets. “We’re looking forward to participating, and seeing all of the students, weather permitting,” Brian Lemmond, owner of Red River Hot Dogs, said. There is some concern of being rained out. Brian explained, since the hot dog stand is not an enclosed truck, it leaves them exposed to the elements. There will not be tables for seating, and music depends on the weather for safety reasons. Stone Oven’s manager, Steven Cook, said he was not aware of the tickets offered by MSU and will not be participating in that respect. Even though Stone Oven sold its truck, they will be setting up a table and preparing a limited menu at the event. Stone Oven also has a gluten-free pizza crust that is available in their brick-and-mortar location. There may be more vendors in attendance but they have yet to confirm their participation at this time. Taylor Dinkins, organizer of the event, refused to comment.